Elena Maria Vidal grew up in the countryside outside of Frederick, Maryland, "fair as the garden of the Lord" as the poet Whittier said of it. As a child she read so many books that her mother had to put restrictions on her hours of reading. During her teenage years, she spent a great deal of her free time writing stories and short novels. Elena graduated in 1984 from Hood College in Frederick with a BA in Psychology, and in 1985 from the State University of New York at Albany with an MA in Modern European History. In 1986, she joined the Secular Order of Our Lady of Mt. Carmel. Elena taught at the Frederick Visitation Academy and worked as a private tutor as well as teaching children's etiquette classes. During a trip to Austria in 1995 she visited the tomb of Empress Maria Theresa in the Capuchin crypt in Vienna. Afterwards she decided to finish a novel about Marie-Antoinette she had started writing ten years before but had put aside. 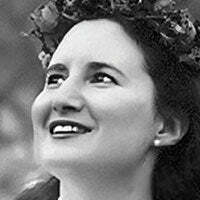 Elena has been a contributor to Canticle Magazine, Touchstone Magazine, The American Conservative and The National Observer. In April 2009 she was a speaker at the Eucharistic Convention in Auckland, New Zealand. In August 2010 Elena spoke at The Catholic Writers Conference in Valley Forge, PA. She is a member of the Catholic Writers Guild and the Eastern Shore Writers Association. She currently lives in Maryland with her family.